1965 | The Fantastic Flame On! Hello and welcome to the 44th episode of the show. This week, Andy and Steve are joined by Christine Hanefalk, writer of theThe Other Murdock Papers blog and host of The Other Murdock Paper podcast. Why do we have such an incredibly awesome co-host who has dedicated large amounts of time and creativity to a blind lawyer who is definitely not a super-hero oh no not at all? Well, Fantastic Four #39 is the first of a two-part epic featuring an attack from Doctor Doom, a powerless set of heroes, and a special guest-appearance from Daredevil! As well as this, Strange Tales #133 sees the return of the Puppet Master in a tale that… well… it’s an issue of Strange Tales. ’nuff said. All this, and singing, mispronunciation, impressions of Jackie Mason, some thoroughly filthy suggestions regarding what Reed can do with his technology, and a special appearance of Stan’s ability to completely forget the names of his characters. 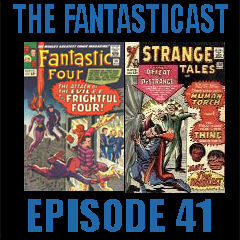 Send feedback to the show to fantastic4podcast@gmail.com or through the comments on this blog. Hey, look at that – we’re all caught up now! 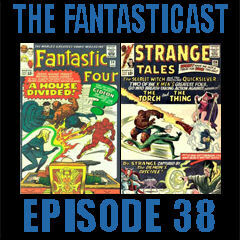 Hello and welcome to the new look for the Fantasticast. The wonderful Mike Georgiou has designed a band-spanking new image for the show, which you’ll have seen on our facebook page, on our twitter account, and, if you’ve grabbed the episode through itunes or another podcatcher, you’ll be seeing it on the show’s page there.Check out Mike’s work at his website,follow him on twitter, and maybe grab a copy of his great comic, Elemental Micah. And huge thanks go to Samuel Savage for adapting the image into our new format episode cover image! Anyway, in today’s episode, Andy and Steve face off against the returned Frightful Four, featuring the first appearance of The Trapster, in Fantastic Four #38. Then, a spot of undercover work at NASA goes awry in Strange Tales #132. Along the way, we’ve got masked psychopaths, Man of Steel spoilers, a reluctant admission that Strange Tales may not be crap, some new Avengers (no, not New Avengers! ), and a sweary priest. This week, we look at Fantastic Four #37, as the team head into space to exact bloody vengeance upon the party responsible for the death of Dr Storm. Then, in Strange Tales #131, Johnny and Ben face off against the Mad Thinker, who has clearly been watching The Dam Busters. If you’re looking at the image and thinking ‘gosh, that looks different’, then you’re right. Michael Georgiou – http://www.mikedraws.co.uk/ – has created a wonderful cover image for the show that you’ll see rolled out across the websites, facebook and twitter pages very soon. Then, Samuel Savage took a shot at creating an episode cover image, so we thought we’d use it. Thanks to Mike for his amazing talent, and to Sam for the episode graphic. It’s challenge week over at The Fantasticast, as a surprising e-mail to the show leads Andy into uncharted vocal territory. Fantastic Four #35 sees a whole slew of firsts for the title. The Wizard and Paste-Pot Pete escape from Strange Tales, The Sandman transfers over from Amazing Spider-Man, and we get the first ever appearance of a member of the Inhumans – Medusa. Then, in Strange Tales #130, Steve and Andy’s American accent get to grips with a guest-appearance by none other than… The Beatles. Joining us at the very end of the episode (and at no other point) is Beatles and Marvel Comics podcaster Josh Lapin-Bertone to briefly look at the Fab Four’s appearance in Marvel continuity and to introduce the number one song, co-incidentally a Beatles track. Many thanks to Josh for joining the show for a couple of minutes. In the second half of our coverage of books cover-dated February 1965, love blossoms unexpectedly. 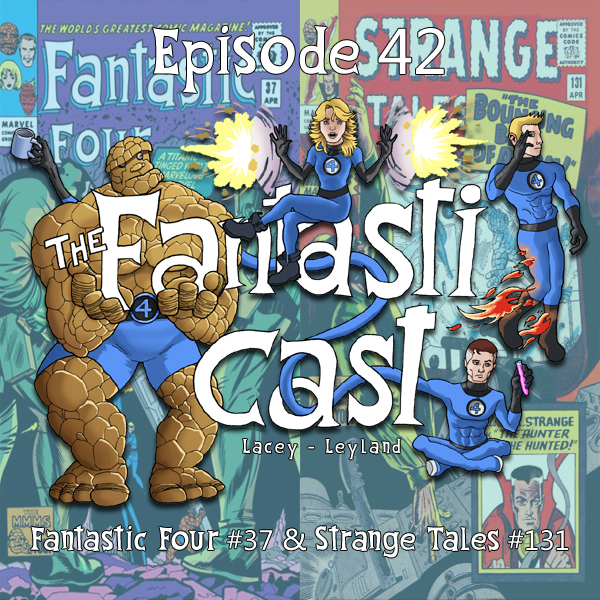 Steve and Andy take a look at Fantastic Four #35, as a giant dragon somehow comes to life and terrorises Ben and Reed’s alma mater. Then in Strange Tales #129, some gubbins involving a train and some pathetic henchmen. Yes, it’s been a few weeks. I’ve been busy, putting together a series of interviews from May’s London MCM Comic-Con for the 20 Minute Longbox, turning 30, and meeting Joss Whedon, Neil Gaiman and turning 30 all in the space of one fantastically geeky week. I’m behind on linking recent episodes, so I’m going to use the next few days to catch the blog up to date with this weekend’s episode, before returning to the grind of chronicling every single usage of Flame On, It’s Clobberin’ Time, and more. 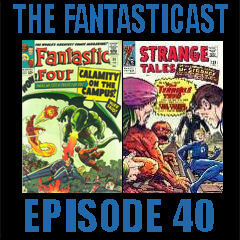 Today, we throw the rules out of the window and staunchly refuse to read any issue of Fantastic Four or Strange Tales. Instead, guided by editors notes, we attempt to put the comics cover-dated February 1965 into some sort of continuity order. We also spend some time with your e-mails, and then – we’re off! We’ve split the episode into two, to prevent audio overload and to allow Steve some time to edit. 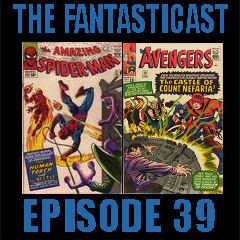 So, you get weekly Fantasticast for the next couple of weeks. Enjoy! But did you know his favourite team is the FF? The Family who punches dirty turkeys in the face. That’s right, True Believer, punch all those turkeys. Pun ’em in their turkey necks. And these turkeys get wordy ’bout New York like it’s a real place! Get ready turkeys, we goin’ crazy, chattin’ ’bout the Four with Andy and Steve! This week sees a slightly-shorter-than-usual episode, for a few reasons. One is we’re only covering two comics this time around. Another is that Strange Tales doesn’t have a great deal going for it. And another is that Steve’s mic was creating some pretty bad sounds, so he edited the heck out of the episode to minimise its impact.